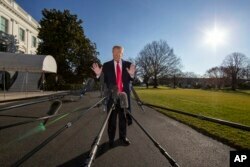 FILE - President Donald Trump speaks on the South Lawn of the White House with the presidential Marine One helicopter seen in the background, Jan. 6, 2019, in Washington. 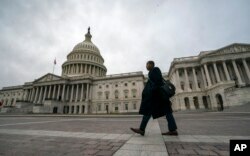 The U.S. Capitol is seen as the partial government shutdown lurches into a third week with President Donald Trump standing firm in his border wall funding demands, in Washington, Jan. 7, 2019. Trump, however, now is saying he would agree to a steel barrier instead of a concrete wall he has long vowed to build. Trump said again Monday that he could declare a national emergency to build the wall without approval from lawmakers, but added on Twitter, "Let's get our deal done in Congress! Trump's tweet referenced Democratic Congressman Adam Smith, the new chairman of the House Armed Services Committee, citing him as saying there is a provision in the law that allows the president to declare an emergency. Later on CNN, however, Smith said that declaring an emergency would be "horrible policy" and a "terrible idea," and that the president would be challenged in court if he sought to build the wall without congressional authorization. President Donald Trump speaks on the South Lawn of the White House as he walks to Marine One, Jan. 6, 2019, in Washington. 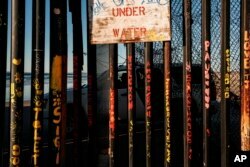 ​The Trump administration called for approval of $5.7 billion for the wall, along with another $800 million for "urgent humanitarian needs" to take care of migrants arriving at the border trying to enter the United States. 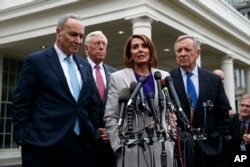 But Democrats opposed to Trump's demand for the wall said there was no progress in talks over the weekend over how to resolve the border security issue and reopen the government. A border patrol office inside his vehicle guards the border fence at the U.S. side of San Diego, California, as seen from Tijuana, Mexico, Jan. 2, 2019. Trump said Sunday he can "relate" to the workers missing paychecks starting this week, but said he expects the 800,000 workers "that are on the receiving end will make adjustments. They always do. People understand what's going on." He said, "Many of those people that won't be receiving a paycheck, many of those people agree 100 percent with what I'm doing," although there has been no survey of government workers' views on Trump's wall proposal. Some border security officials said they agree with his demand for a wall. 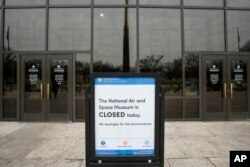 The Smithsonian Institution National Air and Space Museum is seen shuttered during the partial government shutdown, Jan. 4, 2019, in Washington. Democratic House Speaker Nancy Pelosi said a priority would be to reopen the Treasury Department and Internal Revenue Service, "an action necessary to make sure working families received their tax refunds on schedule." Senate Majority Leader Mitch McConnell rejected a previous House package that would have funded most of the agencies through the end of September and the Department of Homeland Security for a month to allow for further border security negotiations. McConnell called the plan a "non-starter," saying it was a waste of time for the Senate to vote on any shutdown-related legislation that Trump opposes. Speaker of the House Nancy Pelosi, flanked by Democratic colleagues, speaks to reporters after meeting with President Donald Trump about border security at the White House, Jan. 4, 2019. "They are essentially the same funding bills that the Republican Senate wrote and approved by a 92-6 margin during the last Congress," Hoyer said in a statement Sunday. Trump contends the wall is needed to stop migrants from illegally crossing into the U.S. from Mexico, as well as preventing drug trafficking and terrorism. Trump said Sunday that if Democrats are willing to make a deal, one could be reached "in 20 minutes if they want to." Otherwise, Trump said, the shutdown is "going to go on for a long time."